Sitting in the middle of the arid desert under his tent, an old Yemeni sees a pilgrim passing by and offers him hospitality. The traveller noted the beauty of the carpet on which they were sitting and learnt that his venerable host had four daughters who all left him to get married. They were renowned for making the finest carpets of this montainous and cold region. Before leaving, the daughters made the carpet on which they were sitting. The oldest daughter sheared the sheep and spinned the wool, the second daughter designed the drawings and chose the colors, the third one wovened the carpet and the youngest daughter was sitting on it when she met her husband. Today, the old man is feeling a little sad about giving away the carpet but he agrees to leave it to such a fine connoisseur. He poured a very sweetened mint tea to his guest. By the time the teapot was empty, the two men had agreed on a price for the carpet and the guest went back on the road, his purchase rolled on his shoulder. The seller then takes out another carpet from his stock and smokes his narguile, waiting for the next customer. Since the dawn of time, it has always been all about a good product, a good story, a good location and a good price. Based on the success of leading brands, the story telling has now been marketed by advertising agencies. Can a brand's history sustainably be invented? Here are two brand stories and their decoding. As the grandson of a shoemaker and son of a minor shoe industrialist, everything predestined Diego Della Valle to turn shoes into his life passion. At the end of the 70's, the family factory, located in the Italian region of Marche, handcrafts not only shoes for the major creators of that time including Azzedine Alaia and Christian Lacroix, but also Della Valle shoes which are sold in the family owned shop on the ground floor of the brand's commercial showroom on via Della Spiga in Milano. While remaining within his family, Diego, who had turned 25 ans in 1978, wanted to tell his own story. At a time when Creators had the upper hand, Italians were fond of the Anglo-saxon elegance of the 30's and the 50's, their icons are Gary Cooper, Cary Grant, James Stewart, Clark Gable, Fred Astaire and the Kennedys ; but also New York, Boston and Cape Cod. Flair and luck are part of talent, the brand will turn into a planetary success. It is therefore natural that Della Valle chooses a brand with an American-sounding name. Diego built the brand around a model of moccasins which embody what America looked like then, the car shoe his father was already manufacturing. After that, he will randomly pick from a New York telephone directory a name easy to remember and pronounce in every language, J.P. Tod's. The J.P. Part will rapidly be scrubbed out but Tod's has made its way to fashion history and to Harvard's University where it is an industrial business success case study. Encouraged by the emerging success met in Italy by the mocassin famous for its 133 rubber studs, Diego soon comes to France in order to find for his brand a legitimacy that only Paris is able to provide him with. L'Eclaireur will confirm his notoriety by distributing his mocassins which, at the beginning, didn't trigger so much enthusiasm. The French press, which was at that time focused on hype minimalism coming from Japan and Belgium and trending among creators, was not yet interested in these old school shoes. It is only with the 19th of October 1987 crisis and the returning back to centenary brands that the landmark value of the Tod's brand and shoes will be recognized in France by various magazines: Elle, Vogue Men and Marie Claire which will launch the brand with three full pages in the same week. At this total look times, accessories were nothing more than... acessories in the constitution of a look. Diego Della Valle will show all his inborn talent as a communicator in order to male Tod's a fully-fledged brand and promote it outside Italy. For if Italians are really quick to fire up for a new brand, they are just as quick to turn their back to it after a few weeks. On the contrary, French people with their natural sense of criticism since the 19th century are difficult to seduce. Paris thus had to be seduced in order to open up to Tod's Europe's doors, then the USAs and the whole world to finish. That's what Diego will do by importing to France a common practice in Italy: the Ommagios. He will select a panel from the Parisian audience which counts among others a florist from the Palais Bourbon, a young advertiser who will later become a writer, a junior journalist, a few crowned heads from the UK and Monaco, as well as, of course, French celebrities. These mocassins success will be immediate among the happy few who are happy to be a part of it. This success is also linked to another characteristic of the shoe which is never underlined by the brand itself: its amazing comfort. It is only after ten years that French luxury brands will follow Tod's steps and integrated product placement in their PR strategy, though they are not acostumed to it. John and Jacky Kennedy appear barefoot, and, under the black and white photo, a pair of Tod's moccassins can be seen, in color. Simple and straightforward, the campaign created a buzz. Some picky comments were made about the facts that the brand didn't exist at that time, to which Diego wittingly responded that if it had, the iconic couple would have worn Tod's. Definitely reassured, the Italians will also be convinced by the most elegant of their peers who will appear on TV wearing rubber-studded shoes: the industrialist Gianni Agnelli, who made the brand take off. European success is on its way. The Tod's shoes who were already present in style section of magazines from all around the world conquered the celebrities' section when the latter started to wear them. They also stimulated the economics section. But that's not enough for Diego who, after 8 years of existence, turned the rubber-studded shoes brand into the hypest accessory of the time and the most dramatic success of the beginning of the 90's in the fashion world. The brand kept rethinking its positioning and its PR strategy. The mocasins were first very classical, available only in leather or nubuck, in black, brown and dark blue. It's by bringing some color in its collections, starting by the patent leather in order to gain some popularity among the hipster circles of the middle of the 80's, that Tod's will become a major player of fashion and luxury. As a skilful communicator, Della Valle almost succeeded making everyone forget that he is an industrialist. Predating other luxury houses, who for most of them don't own their own manufacturing infrastructures, Diego will give publicity to his working tool: his plants, his workers trained by the house and paid with a better salary than his competitors' in the region. And to their savoir-faire. The international press informs its clients that he buys for them the best animal skins in the world one year in advance, which are set aside in locked safes in order to guarantee the shoes production and delivery to his shops. “Now you'll know that I really manufacture shoes”, he said to a French journalist who came to visit the factory. Like many founders of successful fashion brands or Luxury Groups, Diego hides to the public his role in the creation or artistic direction of the house. As the only master of his time and of his firm's growth, Dieogo tests a new model or a new platform sometimes during two years before including it in his collection. It took him 15 years to launch the first rubber-studded bags. He probably had the idea on the backburner since the inception of the brand. books paying tribute to the Italian touch and lifestyle, the country's traditions and its crafts that he represents. With his friend Luca di Montezemolo, Diego owns the Charme fund which invested in furniture and Italian design. Diego financed the restoration of the Rome Coliseum, which cost him 25 millions euros. And since the love of football runs in any Italian's veins, he also is the owner of the Fiorentina. The only last thing that he needs is a renowned gourmet restaurant. Italy has become the core of the brand, in the way that Paris and France have become the land of French Luxury. Diego didn't forget about his initial activity though, by entering in 2009 in the capital of the famous American department store, Saks Fifth Avenue and by buying out a part of the Brook Brothers shirts' capital. At the same time, Fiat bought its American competitor, Chrysler, confirming the trend around the building of global groups in all industrial sectors. Fashion is an industry like any other else, but a glamorous one. However, Diego's heart is also French. It is an old tradition that has been uniting the country since the Renaissance, a mutual respect made of shared admiration and petty rivalries. Diego Della Valle, as a fan of Hermès of which he is the transalpine cousin and the neighbour on the rue du Faubourg Saint-Honoré, is also present in France. He bought and revived the shoemaker Roger Vivier, by appointing at its head an old friend, Inès de la Fressange, of whom he appreciates the Parisian elegance and advice. More recently, he enthroned Farida Khelfa as ambassadress of the Schiaparelli house, established on the place Vendôme. Farida is a former model with a typical Parisian style and cheekiness, and she's also Inès' best friend since the Palace times, as well as Jean-Paul Goude and Azzedine Alaia's Muse. Together, they succeded in creating a buzz around the brand without unveiling a singe product. Founder of the Tod's groups and co-owner with his family of the Fay and Hogan brands at the same time, Diego Della Valle also has holdings in many firms including the glasses' giant Safilo. He also is the director of Ferrari and LVMH, to which he sold his perfume brand Acqua di Parma. Diego's long walk took him to the building of the biggest Italian luxury group, to which he brings his industrial and political vision. His group promotes quality and aims at preserving the Italian industrial sector as well as its culture. Some see in him a top-level future politician. Thierry Gillier was born into the profession. He’s from a family of hosiers settled in the city of Troyes for three generations, and who invented the Lacoste shirt and the Jil underwear. After having enhanced knitted collections for leading designers of the 80’s such as Yves Saint Laurent and Thierry Mugler, Thierry and his brother decide to launch their own brand of knitted products. Together, they create ATG (Arnaud and Thierry Gillier) which has proven successful thanks to its camel hair pullovers, in Europe but in Japan mainly where the brand will enjoy the highly-coveted status of Creator. The 1991 Gulf War along with the economic crisis led ATG’s investor, the Mitsubishi group, to brutally put an end to the experience, by fax. Thierry Gillier says that this crisis has in fact been providential and that it saved his life. He disagreed with the creation mode of his “Creator” brand and he couldn’t stand fashion shows and the too narcissistic and pompous ceremonial around them. Thierry is a graduate in Arts and Media from the Bart College in New York, who for two years dedicated himself to his other passion : painting. Thierry also enjoyed the opportunity to travel and to reinterpret “Zadig; or the Book of Fate”, a philosophical tale written by Voltaire in 1748 which was directly inspired by a Quran Surah, the Cave, (S.18; V.60-82) “it is necessary to accept that evil is necessary to the world order and from evil, will emerge the good”. This Surah reminds us of our nowadays quantum physics. This introspective period will lead Thierry to be aware that he has his own fashion sense, which is more similar to the approach of Agnès B. than to the creators’. At the same time, fashion is undergoing deep changes, big French and Italian Luxury Groups are emerging in the world of Luxury. Thierry founds the Zadig & Voltaire house, following the economic steps of these creative yet structured brands. He soon became the inventor of the new emerging type of brands whose motto is “affordable luxury”. The industrialist’s grandson has been followed by Sandro, Maje, and the Kooples from the Sentier neighbourhood in Paris, as well as by designers such as Isabelle Marant and Vanessa Bruno. All of them are born in the profession, like him, except Isabelle Marant who is the daughter of a former fashion model. Thierry Gillier has an genuine knitting culture which allowed him to reinvent the knitting practices, by creating a less close spacing in order to save money on the raw materials budget and obtain an affordable selling price. This was the kicking-off of the loose style. Thierry has also been among the first ones to democratize access to cashmere which prices are dropping while its production is consistently increasing in Asia. By introducing cashmere in its collection, Zadig & Voltaire makes it to the Luxury label. Since the space between the knits is bigger in order to use as little as possible from this material, it is necessary to wear t-shirts under, that’s how Z & V kick starts the layered clothing. He refits military clothes. He invents a whole universe for the brand close to his artistic universe. It takes a lot of adjustments to create a brand, to settle new products and outfits. The mastering of time is one of this entrepreneur’s greatest strengths. He knows about all the fashion industry professions, he knows a great deal about the selection and buying of raw materials, and from the very beginning he understood how decisive it was to delocalize the manufacturing in Asia, but also in Italy for the leather. It is no coincidence that his own office is directly connected to the styling department, where he regularly intervenes on the creations. Thierry also has high-level skills in the real estate industry, he invented a new unique type of merchandising relying on a tightly woven network of the brand stores within the same district, sometimes even the same block, to gain more visibility. In order to gain even more publicity, he installs in the stores front windows big light boxes which serve as signs visible night and day. that the products offered vary from one shop to another from the same district. He created a unique olfactory signature, recognizable in all the brands outlets, so that the brand’s fans associate it with the smell of cashmere. Setting up a brand, create collections, are complex actions, the result of years of experience, of succeedings as well as failings which are equally enriching. And then one day, hardwork and adaptation just pay off, one day you finally get it right, and luck has its say in this story, as long as you strike quickly. Zadig & Voltaire owes its success to its very recognizable tunisian collar shirt and its buttonholes that the plant had forgotten to unpick for the first delivery. Unchanged until now, it has been for the last ten years one of the brand's must haves and the blue overall of all artists, whether they are actors, singers, writers, painters, football players, TV hosts, and of all those who want to achieve this status. Since its launching the brand knew how to conquer the teenagers heart : Zadig & Voltaire remembers them by offering them posters they can pin in their room next to their favorite rock bands,...which are also customers of the brand. In the movie Lol, Lisa Azuelos dresses all members of the blended family in Zading & Voltaire, from the young child to the grandmother, not mentioning the psychologist. Zading & Voltaire has become their blue overall. The brand has always included Rock music in its communication, and now owns its music label. The brand, mother of all slip-ups, has reached the peak of its success, as it is present in all the books from the writer Frédéric Beigbeder, in the lyrics of the Marc Lavoine singers, Renaud and Helmut Fritz. The brand is also mentioned in the Oui FM radio advertising campaigns and at the backburner of all campaigns thought by artistic directors who are in search of the “Zadig & Voltaire woman”. On the occasion of co-branding operations, landmark brands such as Leica or Samsung attract customers who pay attention to fashion and its codes. In exchange, they provide Zadig & Voltaire with credibility and visibility. Without any star designer or emblematic artistic directors, and with reasonable advertising efforts, Zadig & Voltaire, knew how to tie strong emotional bonds with a wide audience. It embodies the new French woman elegance, cool and responsible. The brand convinced the investment firm TA Associates, who paid an amount of money representing eleven times Zadig & Voltaire's profits in order to diversify into the ready-to-wear industry, somewhere halfway between life style and upscale products, and it also got the very conspicuous Thierry Gillier in the club of the one hundred richest people in France. 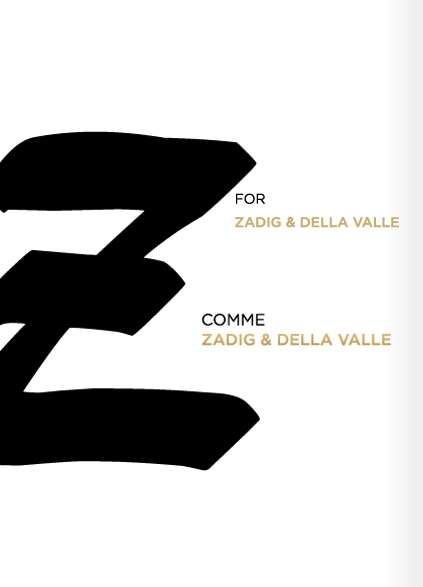 The emerging brand Zading & Voltaire, which is already present all around the world is now in a position to succeed where all other French brands failed: ensure a significant growth in the USA, then Asia, and become, along with the French Luxury Groups a major actor of the French and international fashion. Thierry Gillier is following his path, accompanied by Jesrad, the providential angel from the Quran Surah “The Cave”. Both of these brands are closely bound to their founders' lives, which story they tell. Maybe that's the reason why they tied such strong emotional ties with their customers, just like the way people identify themselves with the scenario and the actors of a movie, without necessarily knowing who is the director. In contrast with a movie which lasts one hour and a half, and gets revived only on the occasion of a remake, a brand can live and dress us up everyday for a hundred years and even more by anticipating its time and without renouncing its founding values. Just like a work of art does, a fashion brand embodies a historical period, trends, the spirit of the decade. This is probably the reason why the press, which point is to analyze in the form of text and image our everyday lives, repeat and accompany them.